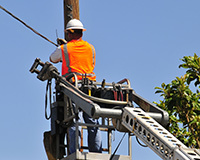 The demand to increase broadband infrastructure and speeds are critical to future growth. KGPCo has a long legacy of serving wireline needs and exceeding expectations. For over 30 years, KGP has partnered with Carrier service providers to deliver the latest in technology through understanding their business needs and leveraging our logistics infrastructure to deploy new service cost-effectively and efficiently. National Logistics Footprint: KGPCo has a national logistics network of distribution centers positioned throughout the United States. Our leading-edge technology throughout our distribution centers ensures greater than 95% accuracy on service levels. Customer Service: KGP customer service is based on a Customer First philosophy. With a seasoned support team, technologies, and online tools KGPCo has the scale and flexibility to customize solutions to fit any business model. Comprehensive Services Portfolio: A full range of services from complete supply chain, distribution and logistics services, in conjunction with, engineer, furnish and install services are unmatched in the communications industry.